Question: Even while reading The Book of Zohar, my thoughts roam about in different directions. How can I always keep the goal in mind? Answer: We are inside of a force field with forces deliberately drawing us in different directions. But this happens precisely in order for us to connect them in one direction, to bring them to a single reality with our own efforts. Therefore, this is how we should view our states, which are often confused and unstable because they are all intended to awaken us to search for a force that’s higher than these opposite forces that awaken within us, so this one force would rule over them. It’s so we could unite them and bring them together as the proper combination of constituents to the spiritual reality. If we find a higher force that forms the entire picture for us, this will already be a higher level than our state. Therefore, on one hand, I must favorably accept these different states, thoughts, desires, and this entire confusion while understanding that I am receiving all of this data to work with, like blocks that I have to put together correctly. Now every person must find for himself what kind of force, principle, and attitude he can use to properly unite all of these disturbances so they will go from being disturbances to components of the same spiritual picture that he wishes to attain. In reality there are no disturbances. They are all desires that are not properly connected into one desire and therefore seem superfluous to us. But that is not so. Each of them, with its aspiration to the opposite direction, deliberately points to the lack of our direction to the single force that includes everyone, the upper level, the force of the Creator. A person does not feel what is above reason or below it. If he does not perceive something inside of reason and does not approve of it in his ego as existing and worthwhile, then he does not attach any significance to it whatsoever. Walking below reason means being under the influence of the society and acting with the reason of others. This is considered unworthy even though we always act precisely in this way since society pressures us and forces us to respect its values. Walking above reason is something we are not capable of at all because this is called walking by faith. For that, a person has to form upper notions for himself which are above his reason in order to convince him with the force of faith and to accept faith as knowledge. That is, he has to unite with the environment and from it receive the proof of authenticity and value. It turns out that a person usually acts within knowledge, filling it by virtue of his environment. And it is very difficult for him to rise above that. Therefore, if we want to accelerate time, this is possible only by walking above reason. After all, if we walk within knowledge then it is simple evolution, the natural course of development. And this takes place until I feel and develop on my own, until I obtain the new knowledge. However, if I am guided by the opinion of the environment, its knowledge becomes mine. And in relation to my previous knowledge, it is already “above knowledge.” That is, my personal perception turns into the social one. It turns out that I replace my reason, which accepted only what was approved by my egoistic desire, with the net of connections between myself and others. And the well-being of others becomes the foundation of my reason. If a person makes this change in his perception, then he exits the bounds of his limitations. Question: Is being tired of life an indicator that I need to rise to a new level? Where does the sensation of being tired come from? Answer: Tiredness comes from a lack of importance of the goal. This is due to the fact that you are not receiving enough positive stimulus from the group. If you were, then you would light up. It is the group’s duty to elevate each of its members. Since the group includes everyone, you must all work together on the common desire and aspiration. Then, everyone will have the strength to advance. It is called mutual guarantee when we all connect in order to give each other the strength to attain the goal of creation. There are two ways by which nature advances us: without our knowing or consciously, meaning by the Light (the Torah) or by suffering. The way we advance without knowing is by pain. Because our nature is a desire to receive, we advance and develop gradually from one degree to another under the influence of a good sensation or a bad one. So what do we sense as good or bad? We were created by the Light, which created us with a desire to be filled. Through our process of development, we gradually attain everything that is in the Light, in the Creator, as good and everything that is in contrast to it we perceive as bad. This is a very long way, and for a long time, according to our nature, everything seems the opposite to us. But as the power of bestowal teaches us, we begin to understand that our egoism is bad and that it is responsible for all our failures, and how wonderful it could be if we were in the attribute of bestowal, which could raise us above all evil. This awakening comes gradually to each of us and to all of humanity. It is through suffering that we learn from the blows that the force pushes us from behind. At the same time, we are given the opportunity to hasten our development by ourselves and to advance towards attaining the good. The good is only bestowal, and we should do different exercises and use different tools in order to develop the sensation of the recognition of evil by ourselves, not as a result of the blows but rather through the environment. In order to do that we have to be more sensitive to good and bad, to bestowal and receiving, to love of others and to hatred. I can prepare myself even before the blow comes, by working with the environment so that I can begin to understand that bestowal is good and receiving is bad. After all, this is how nature is. The Creator determined the goal of Creation: adhesion to the Creator, to His qualities; that is, “As He is merciful and you are merciful too.” So we have to resemble His attributes in all our attributes. This means that I have to transform myself and to understand that my nature is evil and that the Creator’s nature of bestowal is good. The tricks and the means I use in order to see bestowal as good, are called “Mitzvot” (commandments), “God’s work.” Working with the environment enables us to see bestowal as good and egoism as bad. This is why the soul was shattered into many private souls and we can, thanks to our mutual work, attain that connection and love of others, which is good. From the love of others we reach the love of the Creator. It is the particular and the general expression of the same phenomenon. All the descent from the top down, meaning all the preparation that was made for us was necessary so that we will be able to use it and to develop independently and consciously, so that eventually we will reach the goal. Question: We can compare the group to a car that functions only when all its parts are in order. If one of them breaks down, the car will stop. On one hand, this is very exciting, but on the other, it is a bit scary. Could it be that if one person loses the right intention during the convention, nothing will work? Answer: No. 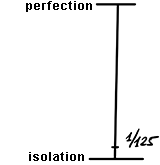 There are 125 degrees that separate us from perfection. The ideal system is still far from us, so in the meantime we are required to do the most corrupt spiritual work on the first degree below. Here you needn’t worry about everyone’s utmost perfection. It is enough if we just try a little—and we will get our first toy car. Even if it isn’t a Porsche, but some piece of junk without an engine, still it’s a car. On the first level, only the initial, “weightless” perfection is required of us, the weakest connection that still has many deficiencies. If in general, we come to the convention with the right desire, it will be enough to attain a 1/125th degree of perfection. It’s in our power to do it. Question (from the Spanish group): We can do some dissemination work today. Half of the people in the group believe that we should do it, and the other half thinks that we need to participate in the Gathering of Friends. What should we do? Answer: Dissemination is more important. It will increase your desire to connect. Whatever you say, it’s better to be involved with the general public. We can see that on ourselves: Had we sat in friends’ gatherings and meetings without going out to the streets during the last three moths, we wouldn’t have attained what we have today. It has rebuilt us, it has changed us. Dissemination is at the basis of change. Thanks to dissemination, we have a greater need to unite, to come together, to understand the material better, to simplify it, and so on. Dissemination builds us, and I am very glad that the groups are starting to understand this. Baal HaSulam wrote about this, and we shouldn’t try to outsmart him, thinking that we can manage on our own without the groups in which we work and without the world to which we bring the message of connection. Despite the childish arrogance, we should be a bit more critical of ourselves, which will help us take part in dissemination. Read what Baal HaSulam wrote and put his words into practice. Question: Tremendous efforts are required in planning and running the December convention. What is the right attitude toward volunteering at the convention? Answer: It is hard to express the importance of everyone putting forth maximum effort, professionalism, and desire. It will be a great loss for those who miss this opportunity. We are talking about a major event at the beginning of a special, fateful year, a truly momentous transformation of all humanity that must move to a new path. It will take place either by great suffering or by the Light that we awaken from within by our exertion and efforts to achieve unity. It is by our desire and efforts that we evoke the Light that will reform us. It is important to understand that we don’t draw the Light directly; rather, we strive for unity, over and over again, although we may be exhausted: These efforts in particular bring us the Light. Even when we feel rejection, frustration, and reluctance, we still make efforts resisting our own resistance, and then we will evoke a most powerful Light. I hope we will reveal great, burning hatred between us and at the same time, with the same intensity, yearn for love. It will be very good if these two poles manifest in us. Let’s hope this happens at least to some extent. So, it isn’t the time for personal calculations of one’s efforts now. No efforts are necessary here, but true self-sacrifice. Everyone must take part in the work as much as possible. Unfortunately, it is very hard to give each one a job. We cannot supply work for all the volunteers, but at home you can prepare and shoot video clips, prepare a variety of materials for dissemination to attract new people, and so on. Look for something of your own if you see that all the jobs are taken here. Question: What duty should I take in order to utilize it in the best possible way? Answer: Choose something that is the most suitable for you. Each one should check himself and find a job according to one’s abilities. If you know something about electricity, ask the electricians. If you know how to cook, go to the kitchen. Question: Perhaps garbage collection would be more beneficial? Answer: Not necessarily. Everyone should do his best. If you are a specialist, you should volunteer where you can be the most helpful. Question: What organ of the “body” of the collective soul will Israel become? Or is it the embryo of Adam? Answer: It will be its head since “Isra-El” means “Li Rosh” or “my head,” as said by the Creator. All people in the world who aspire to reveal the Creator belong to this part of the collective soul. Question: Did the creation of the awareness of the existence of complimentary desires expressed as the will to give and the will to receive create egoism? Does egoism in its extreme form exhibit similarity to a singularity that, in analogy to the astrophysical “black hole,” only receives? Can the breaking out of the cage of egoism be compared with the breaking of a vessel, where the breaking of egoism is the turning of the desire to receive into the opposite desire, namely the desire to give? Does the breaking of egoism and the combination of the desires to give (expressed by individual souls) evolve a creature that has the desire to give? Can this combinatory process be compared to the spiritual equivalent of the big bang that created the material world? Is the creation of the will to give and the will to receive the breaking of a “spiritual singularity” manifested on the human level of reality as the breaking of a material singularity (also called big bang)? Is the purpose of our lives in our reality to drive the evolution of a spiritual reality by virtue of an individual’s intentional breaking of the vessels of egoism (imbalanced awareness of the will to give and receive)? Is an individual’s willful intent to break his own vessel of egoism similar to the original intent of the Creator creating these desires? It is written that we need to yearn to know what we are studying. To know is to connect, as it is written: “And Adam knew his wife Eve.” We want to discover, to establish connection with the forces and states that The Zohar talks about. We want to be in them. We don’t know what they are in and of themselves, but we want to discover ourselves within them since they are the advanced states of our connection, of the formation of the general Kli (vessel or desire). And then, out of the desire to connect to these forces and states, according to the measure of the collective aspiration, we discover the Light that Reforms. It comes closer to us to the extent that we yearn for it.